Dies ist ein bemerkenswertes Haus befindet sich Hobble Creek Canyon in Springville. Einfacher Zugang von der I-15 in Springville, südlich des Provo / Orem. Dieses wunderbare Zuhause ist ein erstaunlicher Rückzugsort, wo die Familien die Ruhe und die Ruhe der Berge genießen und genießen können, aber dennoch nahe genug für Ausflüge wie: Golfen, Schwimmen am neuen Bartholomew Beach, Mountainbiken, Wandern, Vierradfahren und Shopping . Tolle Ferienwohnungen gehören zwei Master-Suiten mit individuellen Bädern auf Haupt-, charmante Küche und Esszimmer und ein zweistöckiges großes Zimmer. Zwei weitere Schlafzimmer im Obergeschoss und Badezimmer. Im Keller finden Sie weitere 3 Schlafzimmer und zwei Badezimmer, Kochnische und zusätzliches Familienzimmer. Tischtennisplatte, Tischfußball, Basketball und Kinderspielzimmer. This house was perfect for our thanksgiving holiday. With 7 bedrooms (including 2 master bedrooms), our family slept VERY comfortably. The kitchen was well-stocked, as were the bathrooms. We had fun watching football, playing ping pong and foosball. The setting was gorgeous with many deer and turkeys walking within view on the land surrounding the home. Thank you for sharing your beautiful home with us. We had a great time! Wonderful. We’re so glad you had an enjoyable stay. Come again! We loved it; a great family home. The layout of the house was wonderful. We could have quiet time upstairs while others were playing and noisy down stairs. It was clean, the views were wonderful, and everything was very convenient. The kitchen was convenient for feeding our entire family. It was roomy and allowed all of us to enjoy the many amenities. The only downer was the poor road leading to the house. Loved the place and had a great time while there. This lovely, well-kept up home provides lots of bedroom and living space for an ideal getaway. 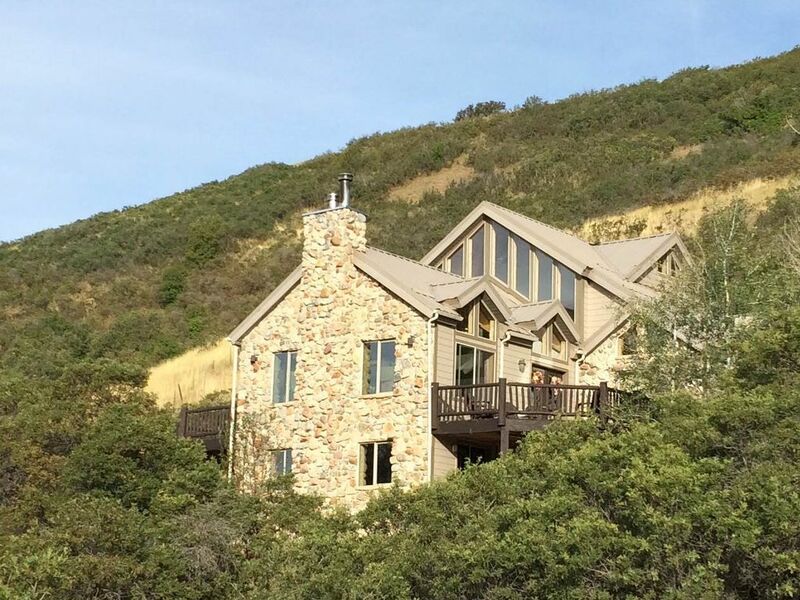 Located up Hobble Creek Canyon, the house is situated up a mile and a half or so of a private, not-always paved road, but once there it is a lovely place for a family get away. The weather up in the canyon is significantly cooler than down in the valley, even on the hottest of summer days, and the view is really great! The kitchen is well-stocked and the great room on the main floor provides lots of space to share together, with an additional large gathering space downstairs as well. Bathrooms are well situated and were easily accessible. Even though the house is well removed from the busy world, less than 20 minutes still gets you to golf, parks, shopping, recreation and a plethora of hiking and outdoor activities, not to mention campus activities at BYU and UVU. Tammy is a wonderful and accommodating host and was very easy to work with. We used this house as part of the housing needed for an extended family reunion and we have zero regrets. Beds were comfortable and there were many bedrooms. There is a second kitchen on the lower level that provided additional flexibility. Cell phone coverage in the canyon is essentially non-existent, but there is wifi at the house, and in the upper bedroom I could even get a little T-mobile coverage. That said, I found it a plus to be basically unplugged from social media for the week-- part of the vacation plus. There is a landline at the house that is available to guests who need to stay in contact. Unlike at other homes we have stayed at we felt completely isolated from neighbors. There is ample parking in the driveway for several cars. Thanks for being such awesome guests! Tammy was immediately responsive to any questions. The home was exactly as advertised and perfect for our large wedding gathering. Thanks for a great weekend. This is a beautiful property up in the canyon. The home is perfect. We had 10 adults in our party and there was plenty of room for more. All amenities are provided and the hosts are great. We arrived a little early and had no where to go. We messaged the owner and asked if we could check in a little early. We received a response within a few minutes and were happily allowed to check in early. This is a great place. You will not be disappointed. Das in der herrlichen majestätischen Berge Utah. Atemberaubende Ausblicke alle von den Fenstern und Decks aus. Nun humpeln Creek Golf Course und Springville (Barholmew) künstlichen Strand an der Mündung der Schlucht bekannt. Startseite befindet sich nur 20 Minuten von der Wasatch Front gelegen.